Family: Cynara scolymus. The artichoke is a member of the milk thistle family and is thought to be native to Arabia, the Mediterranean, Iran, and Turkey. As early as 500 BC, this vegetable was known in Egypt and Rome as an expensive specialty. In the 18th century France, it was considered a “culinary privilege” of the aristocracy. The historical use of the artichoke extends well beyond the realm of kitchen staple and has been used in traditional medicine for centuries as a liver and gallbladder remedy. 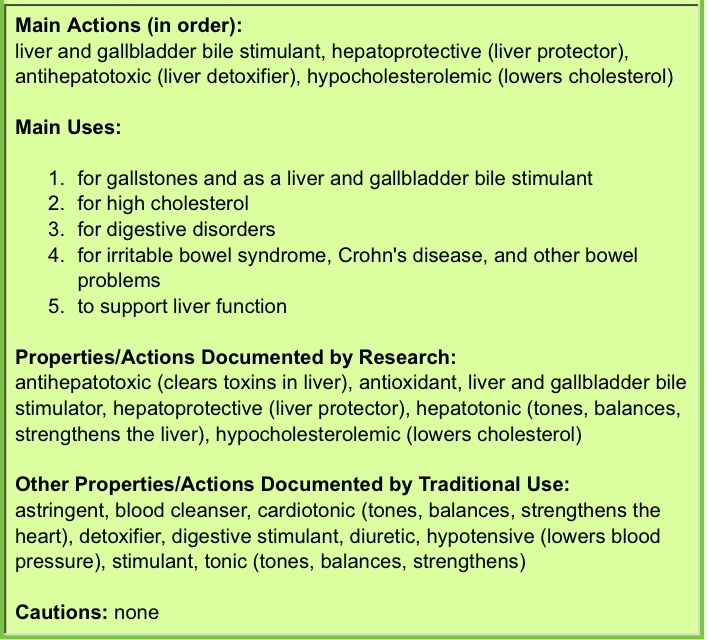 In some cultural herbal medicine practices, leaves are used for liver and gallbladder problems, diabetes, high cholesterol, hypertension, anemia, diarrhea, fevers, ulcers, and gout. Artichokes are high in antioxidants. Something to keep in mind: The artichoke does best in frost-free areas having cool, foggy summers. Freezing temperatures kill the buds, and hot, dry conditions destroy their tenderness. Green Globe and Green Globe Improved are standard commercial varieties grown in milder climates and is my favorite here in the coastal cities of Southern California. These larger plants, with many dark green buds with large hearts, do best if plants are maintained for several years (herbaceous perennial). In 1991 a new hybrid globe variety, Imperial Star, became available (you can thank the horticulturists at the UC Extension Service for this one!). It is more uniform than other varieties produced from seed, reportedly does not need as much vernalization (exposure of plants to low temperatures in order to stimulate flowering) as Green Globe, is thornless, and is primarily green, but has some purple tinting. Imperial Star is a medium sized plant, with many dark green buds with small hearts, good disease resistance and is excellent as an annual crop. This variety has performed well in a broad climate range and is currently being grown both in southern California coastal regions and in desert areas in California and Arizona. Possible seed sources for Imperial Star include: Keithly-Williams Seeds, Contact: Jim Christopherson or Ernie Keithly, 420 Palm Avenue, PO Box 177, Holtville, CA 92250, Phone: 760-356-5533, Fax: 760-356-2409; and: Palmer Seed Co., D., 8269 S Highway 95, Yuma, AZ 85365, Phone: 520-341-8494, Fax: 520-341-8496. Another new variety, Emerald (D. Palmer Seed Co.), is also now available. It has been shown to perform in California in both coastal and inland valley conditions which is great news for my San Fernando Valley clients. Talpiot – The Talpiot artichoke is a late season variety that originated in Israel. This strain has been bred in Spain and produces a medium sized plant with leaves that have no spines and very attractive curved edges. The Talpiot produces very uniform spherical heads and grows to a height of between 2-4 ft.
Brittany artichokes with large green heads (Camus de Bretagne, Camerys, Caribou). There is also a relatively new purple variety that comes from Brittany. They are so named because of its truncated, spherical shape. Secondary varieties classified between Camus and the purple varieties (Blanc Hyerois). Catanese, which are medium large, cylindrical, with closed heads and green outer leaves shading into violet. Romanesco are large, spherical, and closed-headed, with a characteristic opening at the top, and green leaves under an opaque reddish violet colour. Spinoso Sardo is a medium large conical shape, with a closed head and violet-green leaves that taper to a point, and with a large thorn. Violetto di Toscana is a medium-large elliptical closed head, with violet leaves and dark green shading on the inside. Edible arrangement for mar'sel's James Beard dinner in NYC. See the beautiful Violetta Di Romanga in the back? Violetta Di Romagna – is a tender and tasty Italian heirloom artichoke with nice firm flesh. These seeds produce a large thornless plant with silvery-grey leaves and a medium sized rounded violet head of tender, fleshy bracts. This variety is grown traditionally in Northern Italy and should perform well in colder climates. When picked young this variety produces very little inedible choke compared to other heirlooms. Its spineless plants grow up to 5’ tall with silvery foliage for a dramatic statement at the back of the garden so it’s a smash with edible landscapers like me. Its purple color fades when cooked. Vert de Laon, and Violetta di Chioggia, purple varieties that make excellent border plants. I included these beauties in my edible flower arrangements for the tables at mar’sel’s dinner at the James Beard House in NYC last month! Gorgeous in the garden! Grande Buerre – Developed in Great Britain, this variety has spineless heads and grows up to 9 feet tall. Grown from seed. For trial: Northern Star, developed by Peters Seed & Research, is supposed to be perennial without protection even where winter lows go below zero. It was developed by Doug Peters of Peters Seed & Research. Unfortunately, none of my research has turned up a seed source. Here is an interesting article including a wonderful photo gallery on nine different artichoke varieties from Saveur magazine. 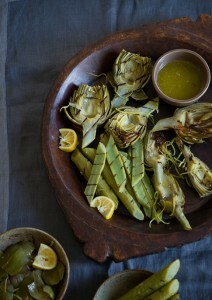 Always harvest your artichokes with stems (they're edible too - see recipe section for cooking tips). Courtesy of whiteonricecouple.com. Artichokes do best in a frost-free coastal area with cool foggy summers. In these conditions the plant receives the proper vernalization and the right conditions throughout its growing period to produce tight, tender buds for an extended period. Proper climatic conditions are extremely important in being successful in growing artichokes. This is why it is critical to find the variety of artichoke best suited for your region. I have been successful in growing Green Globe and Imperial Star artichokes on the coast of Southern California in sandy soil but I’ve also successfully grown them in the heavy clay soil and hotter summers of the San Fernando Valley. In addition to selecting the right variety, soil amendment and good site selection are key when growing in harsher climates. Though I would plant artichokes in full sun on the coast, I might select a part sun location (morning sun) in the hotter areas of the San Fernando Valley. Considered a cool-season crop, they grow best at a 75°F daytime temperature mean with 55°F nighttime temperatures. They have an effective adaptive range of 45° to 85°F. As noted above, Emerald appears to require very little vernalization. In some regions where hotter mid-summer temperatures are experienced, late summer and early fall planting should be planned to avoid fast flower stalk growth and poor quality. Imperial Star is reported to be tolerant of warm summer temperatures. 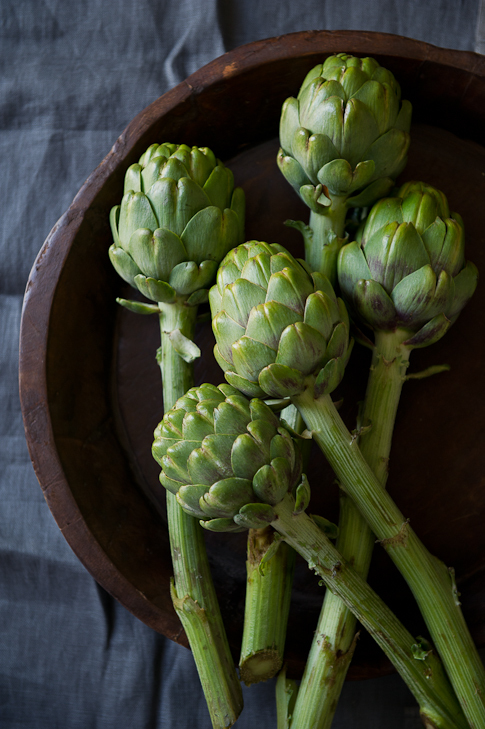 A hot dry climate causes artichoke buds to open quickly and destroys the tenderness of the edible parts. In the summer, irrigation may be used to keep temperatures down in the crop canopy to prevent bud opening. Care must be taken that artichokes are not exposed to temperatures below 25 F in the winter. Where this happens, straw mulching is recommended. In these regions, you can chop off the stalks in the fall after the last harvest and lay a mulch before the first frost to over winter. At temperatures under 15 F expect severe loss of crowns even with mulch protection. At temperatures near or below freezing the outer skin of the bud scales ruptures, making the bud blistered with a whitish appearance. After a few days the blistered skin turns dark but this won’t effect flavor. Artichokes are deep-rooted plants adapted to a wide range of soil types, but will perform best in well-drained, deep soil high in organic matter with a pH between 6.5 and 8.0. The extremes of heavy clay and light sandy soils should be avoided. Raised-beds are recommended where drainage is poor as in areas with heavy clay. Using raised beds will result in warmer soil temperatures in the spring and faster establishment. The artichoke is a perennial, so prepare the soil well before planting. Mix manure, compost, or other organic matter into the first foot of soil in about equal amounts. A minimum of 1-inch water/week is required. 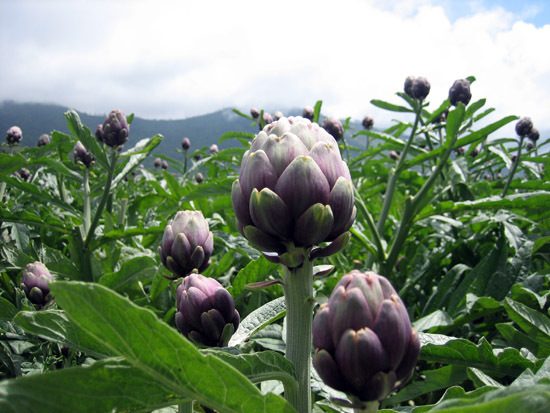 Artichokes require frequent irrigation during the growing season, and water stress results in loose buds. However artichokes absolutely won’t tolerate being water logged so planting in well draining soil is essential. Irrigate more often in warm areas and less often in areas with heavy soil. Shallow cultivation and hand-pulling are the preferred methods. Transplanting nursery starts is the preferred method of getting these beautiful plants into your home garden. Remember that these plants need leg and arm room! They develop a long tap root so make sure you’re giving them enough depth as well as enough room to spread out their growing foliage. Width required depends on variety but leaving about 3 feet on center between plants in a home garden or landscape is usually fine. I use the shade this plant will cast as shelter for smaller, more heat sensitive plants that I plant around it. Like any nursery stock you purchase, select plants carefully. 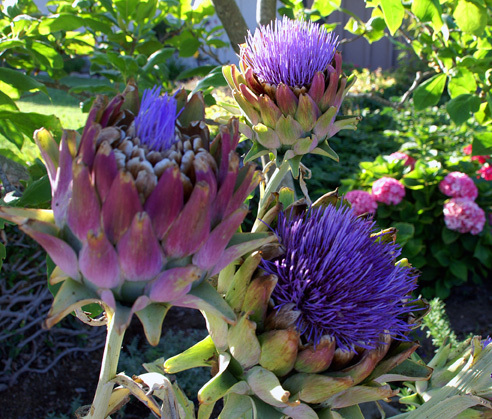 Two methods of propagating artichokes are available to the home gardener. Few artichokes breed true to seed so divisions are usually taken to multiply the plants, similar to starting rhubarb. A healthy plant can be dug up, the root divided into two or more parts and replanted. These divisions or offshoots are planted about 6 inches deep so that the tops are flush with the soil surface. While individual plants may live up to 15 years or more, divide about every 3 years to keep planting productive. Planting from seed is not recommended because results are not predictable and usually inferior to parent plants. But if you do, start seeds about 8 to 12 weeks before last frost. Harden off in cold frame. Plants require 2-3 months to reach transplantable size. Cold treatment of starts (keeping temperature between 35 F and 50 F for about 10 days) can induce flowering in first-year plants. Transplant outside after soil has reached 60 F. It is not uncommon to have no flowering the first year. Artichokes are heavy feeders that develop large foliage and require additional nitrogen fertilization during the growing season. In areas where plants can produce all year around, feed them in the fall with a high nitrogen fertilizer. In cold areas, feed in the spring. Use a side-dressing to fertilize. Apply approximately 1/10 pound of an organic nitrogen source per plant when the new crown growth begins. This equals 1 pound (2 cups) of a 10 percent nitrogen fertilizer. During the harvest season, apply 1/4 to 1/3 of the above amounts monthly. I use blood meal (using care not to over apply) and then bone meal six to eight weeks after harvest to help promote development of late buds. In my garden at mar’sel restaurant at Terranea Resort, on the bluffs of Rancho Palos Verdes, we’re on our 3rd harvest, having transplanted those plants (Green Globe and Imperial Star) last fall. I stress that just by adding organic matter such as well-rotted manure or compost to the soil before planting and seasonally you will increase the level of nutrients, improve soil microbial activity, and increase water-holding and nutrient-holding capacity. Organic matter also improves the physical condition or texture of the soil for cultivation and improves soil structure so the surface of the soil does not crust. Any soil can be/should be improved through the addition of organic matter. As HGEL has often advised, cover crops are also an important, inexpensive way to add organic matter to the soil, and much of plants nitrogen needs can be met via cover cropping. Before applying amendment or fertilizer it is always a good idea to do a soil test so that you know exactly what is in or isn’t in your soil. Contact your local County Extension office for information on soil testing. Fertilizer may be either broadcast and worked into the soil before planting time or side dressed two inches to the side and three inches below the seed at the time of planting. Since artichokes are a perennial plant, it can be overwintered in most areas. After the plant has finish producing, I cut the stalk back to about 6 inches above ground. Mulch thoroughly with a 2″ layer of organic mulch or place under hoop houses. Another alternative is to dig roots and store in a cold (but not freezing) room. Pot up about a month before transplanting out after last frost. The primary insect pests observed are aphids, spider mites and powdery mildew a common disease. See the link above for full diagnosis and treatment of both pests and diseases from UC Davis IPM. Aphids – A hard stream of water can be used to remove aphids from plants. Wash off with water occasionally as needed early in the day. Spraying with organic horticultural oil is also effective as long as applied regularly and thoroughly. Check for evidence of natural enemies such as gray-brown or bloated parasitized aphids and the presence of alligator-like larvae of lady beetles and lacewings. Studying the problem and trying to determine why it occurred should help prevent similar problems in the future. This will, of course, take time to learn and develop. Unless gardeners refuse to use any pesticides, they may at times choose to apply some organic pesticides to save a specific crop. According to UC Davis: Harvesting begins with the maturing of the first buds in fall and continues normally through the following spring unless interrupted by frost. Peak production occurs in spring. Handle buds carefully during harvest to avoid bruising bud leaves. Cut artichokes from their stems about 1 to 1-1/2 inches below the bud base. Use immediately or refrigerate as soon as possible after harvesting. Artichokes may be stored for 1 to2 weeks at 32°F. Buds allowed to become over mature will be loose, fibrous and inedible. 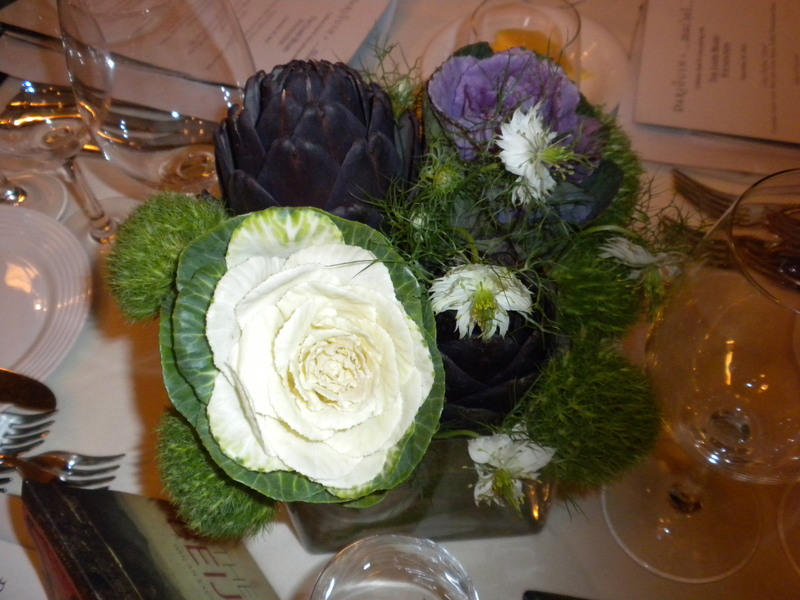 However, artichoke blossoms are gorgeous as fresh or dried flowers and attracts pollinators. Did you know that prepared and cooked, whole artichokes freeze well? Yes they do! To freeze only the hearts, first clean, discard tough outer leaves until you see “pale green” leaves, and cut off tips. Next blanch in boiling water for 2–3 minutes, immerse immediately in cold water, and freeze for later use. Watch this fun with Mark Bittman and Isaac Mizrahi kibitzing while teaching us how to braise artichokes! I am curious about using the leaves of the artichoke plant mentioned at the beginning of the article concerning medicial uses. Would they be dried and used in a tea? Not an expert on that Jackie. There are many books on the medicinal use of plants but, always got to caution to consult a medical expert before using any plant in a medicinal way since may can be toxic in some situations. It’s a shame you don’t have a donate button! I’d definitely donate to this excellent blog! I guess for now i’ll settle for bookmarking and adding your RSS feed to my Google account. I look forward to new updates and will share this website with my Facebook group. Talk soon! So appreciate the love! Please also “like” the Home Grown Landscapes Facebook page at http://www.facebook.com/myhgel. Let’s stay in touch! Hi Tony! Thanks for the kind words! You have a very interesting site! Let’s chat…info@groedibles.com. 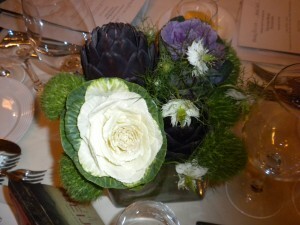 We ate violet artichokes last night for the first time. They are so much hardier than my green globe ones. Real surprise for me. Tender and delicious!! Drizzled lime scented olive oil over them and steamed them. Aren’t they lovely? Beautiful in the garden and on the plate too! We are moving towards edible landscaping in the front yard and I am thinking of artichokes in the parkway between the street and sidewalk. We live in Culver City in a chinese elm neighborhood. Do you think artichokes would be happy there? Full sun, light, loamy soil should be fine!